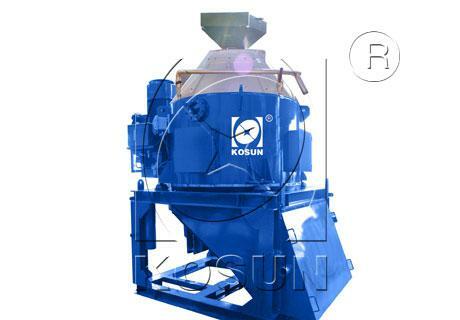 VC-1000 series Vertical Cuttings Dryer( Vertical Centrifuge) produced by KOSUN is a type of vertical centrifuge, which can perform solid/liquid separation through centrifugal separation. The vertical cuttings dryer can effectively recover the liquid phase in drilling cuttings, making the solid phase become very dry. VC-1000 series Vertical Cuttings Dryer( Vertical Centrifuge) produced by KOSUN is a type of vertical centrifuge, which can perform solid/liquid separation through centrifugal separation. The vertical cuttings dryer can effectively recover the liquid phase in drilling cuttings, making the solid phase become very dry. It is suitable for water-base mud, oil-base mud and synthetic base mud. By recovering the mud in drilling cuttings, the vertical cuttings dryercan reduce the drilling cost and cut down environmental pollution. With handling capacity of 40-60 T/h, the oil on cuttings (OOC) of drilling cuttings can be reduced to lower than 5% (w/w) after treatment, meeting the international emissions standards and environmental protection requirements. The vertical centrifuge can also be applicable for drilling waste management in onshore and offshore drilling. Offshore and onshore projects where the recovery of valuable drilling fluid from cuttings, as well as recovery of whole mud lost from shaker failure, rig motion and screen blinding are priorities. More stringent cuttings-discharge regulations have pressured operators and drilling contractors to reduce drilling waste volumes and recover premium products for reuse. The vertical cuttings dryer features a state-of-the-art design that can process varying amounts of cuttings and fluids, typically up to 60 tons per hour. Dry solids discharged from the dryer are typically≤5% oil content by wet weight. The vertical cuttings dryer improves overall cost-efficiency, producing reduced amounts of extremely dry cuttings for disposal and recovering valuable fluid for reuse. It is effective with water-, oil- and synthetic-base drilling fluids. • Recovers whole mud lost from shale shaker failure, rig motion and screen blinding, that is cost- effective. Since 1992, with more than 20 years of industrial experience of manufacturing and design, KOSUN has won its reputation across the worldwide clients. It is the largest and professional drilling solids control equipment manufacturer in China. It can provide and design full range of solids control equipment for different operation capacities and requirements. The main products of KOSUN include oilfield shale shaker, decanter centrifuge, desander, desilter, drilling fluids mud cleaner, vacuum degasser, centrifugal pump, submersible slurry pump, shear pump, mud agitator, mud gun, jet mud mixer, mud tank, diesel tank, water tank, complete solids control system, etc.